As the month of May is almost ending, I thought I’d blog about the one thing I enjoy most in India – street style shopping for beautiful summer dresses! The summer month has been intense, high and if you are a Banglorean, I’m sure you must have been confused with the stormy skies, the hail, and the torrential rains to decide the best summer outfit. I find the season beautiful, really! If you want to check out what I’ve doing for the summer, don’t forget to view the crushing on florals and the nautical stripes fashion. This time, I’d like to blog about my Goan dress pics. After florals and stripes, I decided to shop at the one place I find best almost all throughout the year. Goa! Well, I had taken a short trip back to my hometown some time ago, and I can’t help but browse through all the street shopping. I was with a great bunch of people and our eyes fell on this colourful number. This fits like a glove, is airy, breezy and I so love to just pair it with anything and hop out. I don’t feel the need to accessorise it much. I believe in one thing – KISS (Keep it simple, stupid!) Despite all the swanky malls and boutiques, I love to browse around to pick up great deals that add to my wardrobe collection. And, I don’t think you always need to restrict yourself while shopping. Being, the shopaholic that I am, I’m sure fellow bloggers will understand. And of course, a pair of simple flats as I like to be comfortable when I browse. Accessories must be minimal for the summer weather unless you are always in an air-conditioned room! The summer in Bangalore has been one mystifying season. It lends its heat and can get so crazily aggressive in an instant. As the wind howls towards the afternoon, you know you’d experience two seasons in just a single day. The large drops of rain crashing of the glass panes bring relief to the earth that is already scorched in the daylight. How I love the summer and it’s ironical I write about the monsoons for a summer fashion post. But then, fellow Bangaloreans will know what exactly I mean. The various moods of the city add a certain kind of romance in the air. I think I identify with this weather. Calm and serene yet aggressive and so full of passion 🙂 This is quite contrary to the beautiful land of Goa. I’ve stayed in Goa since I was a child and believe me, the rains were a time for endless paper boats sent floating on the roads already filled with water, watching the coconut trees sway dangerously, and looking out for the next lightening in the dark sky followed by a loud clap of thunder. When monsoons begin in Goa, there’s no saying when you’d see the Sun God all shining brightly! But then, monsoons are monsoons! And, Goan monsoons are beautiful, enigmatic and the sea roars in all her fury. 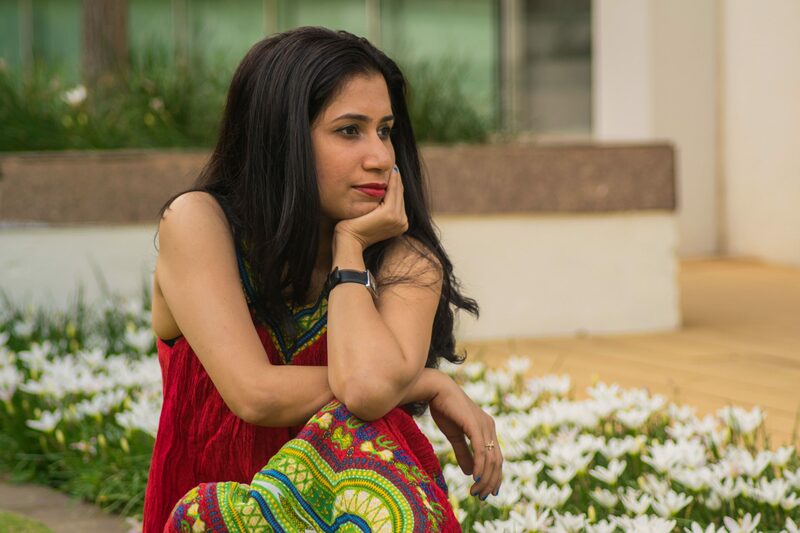 I chose this bright red dress for the summer as it can get gloomy in Bangalore. I’d like a pop of colour always! Be it the dress or my nails! Do you have favourite place to street stop? Do let me know as I’d love to visit those as well! Have been a great fan on your blog. Being a working women, I seldom get time to go out there and shop. Everytime you show case your cloth line, its just mesmerising. Just wonder if you can you assist in procuring these things? Wow! Every detail of this outfit looks incredible! You are so inspiring lady, as you ideally team every item in your wardrobe. Every blog post is so inspiring! The dress is absolutely gorgeous! What I love about it, then its versatility! Thank you, Pamela. I guess shopping for the right items from the right places help! You have a great site!